Having the great portable players Acer Iconia Tab A500 and its sister models is a really pleasant thing. It’s the perfect choice for watching videos and movies on the go. However, it can’t play DVD movies directly. You may be wondering whether there is a way to convert DVD to Acer Iconia Tab A500 and other models. Following guidance will teach you in detail. 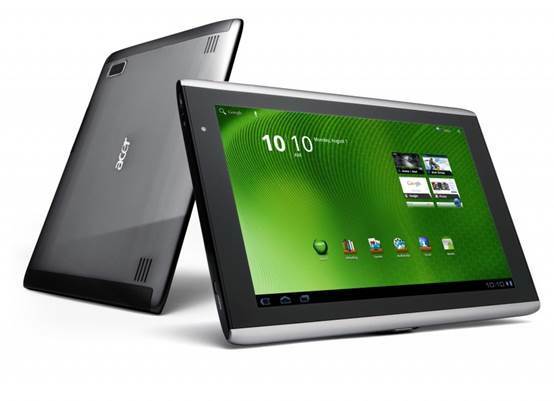 Part 1: Introduction to Acer Iconia Tab A500 and its sister models. Part 2: Why do we need to convert DVD to Acer Iconia Tab? Part 3: Future outlook for Acer Iconia Tab development. Acer tablets such as Iconia A500, A100 and W500 are all great portable media players for watching videos and movies on the go. However, it’s a pity that Acer tablets cannot play DVD movies directly. what if you want to play DVD movies on Iconia A500? You may be wondering whether there is a way to watch DVD videos on Acer Iconia tablets and looking for solutions on the Internet. Now you are just in the right place. The Acer Iconia A500 is a tablet computer designed, developed and marketed by Acer Inc.. The A500 launched with the Android Honeycomb operating system which is now upgradable to Ice Cream Sandwich 4.0.3 (since April 2012). The tablet is also sold in almost identical form as the Packard Bell Liberty Tab G100. The Acer ICONIA TAB A500 provides the ultimate tablet experience with its gleaming 10.1″ touch screen and attention grabbing metallic design fueled by top-of-the-line technology and the latest Android Honeycomb OS. maximize your enjoyment and have fun with Google Apps like Google Movies and Google Music, connect to social networks, play console-quality games, browse the Web in accelerated speeds and so much more. If you get one Acer tablet, you must expect its multimedia enjoyment. However, same as other tablets, one of the few drawbacks is that the Acer Iconia tablets do have a DVD drive and cannot play DVD movies directly. Ever wondered convert DVD to Acer Iconia Tab while you are looking at your DVD collections? Well, here we’re going to show you how to convert videos or DVD movies to Acer Iconia A500 Tablet with Leawo DVD Ripper. 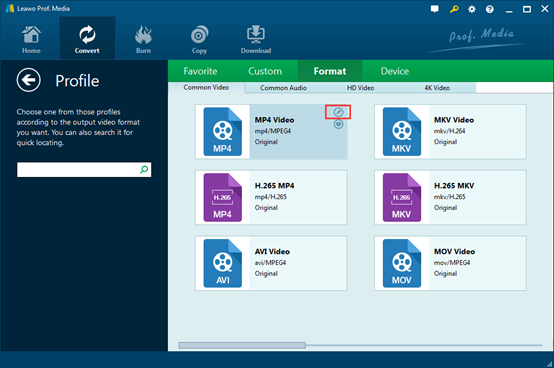 MP4, H.264, H.263 are formats supported by Acer Iconia A500 Tabet. In order to watch DVDs on Acer Ioncia tablets, you need to convert DVD to Acer tablet supported video formats first of which you will need a DVD to Acer Iconia A500 Tablet converter. And the best one on the market is Leawo DVD Ripper. 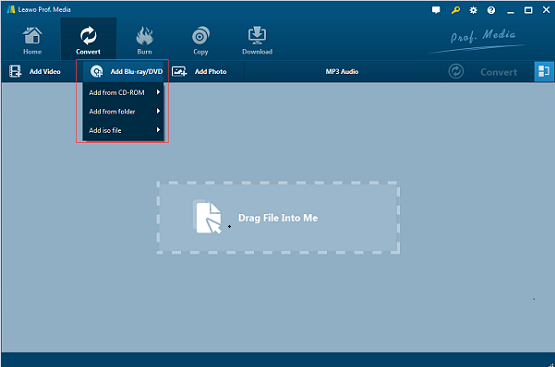 Leawo DVD Ripper is a top-rated and a professional DVD to Video converter for you to rip DVD to video and audio in any formats for importing to various media devices, like MP4, MPEG, WMV, MOV, MKV, FLV, RMVB, etc. And rip DVD to portable media players: iPhone, iPad, iPod, Xperia, Samsung, PSP, PS3, PS VITA, Xbox 360, Sony, etc. No matter what kind of DVD you want to grab and how you want to convert it, Leawo DVD Ripper can do it for you with an amazing speed because it uses the leading NVIDIA CUDA acceleration technology. It’s user-friendly with multiple DIY functions for you to edit your video after converting. And most importantly, it can do it without any quality loss. 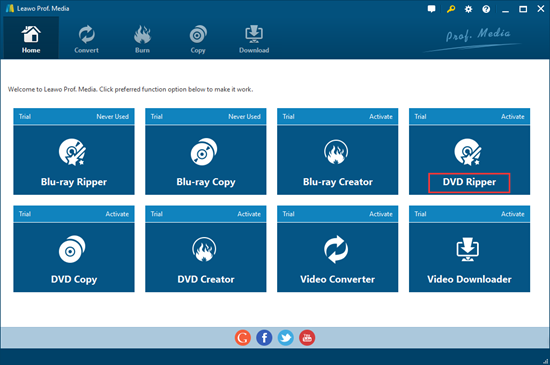 You have 2 options to load DVD content: Under Convert section, click "Add Blu-ray/DVD" button to load source DVD content or drag iso file directly into converting. Step 3: Set output profile. Click the drop-down box next to the “Add photo” button, and then click “Change” to select output format. You can choose output format at your will under three columns: Multiple Common Video, Common Audio and HD Video formats. By making use of the Profile Search bar on the left side, you could quickly search out desired format. Let the mouse stay on top of each format and then you could see a “Edit” icon, by clicking which you could adjust video and audio parameters of output format, including: video codec, quality, bit rate, frame rate, aspect ratio, channel, audio codec, resolution, etc. You could also enter the Profile Settings panel by clicking “MP4 Video > Edit” option. Click the big green “Convert” button to let Leawo DVD Ripper start converting DVD to MP4. Upon completion, follow the instructions to set the output directory and after-conversion settings. You could “Cancel” any conversion at any time as you like. Step 5: The last step. After the converted movie has been saved, you can connect your Acer Iconia Tab to your computer through a USB cord and send the converted movie to your tablet for easy enjoyment! Interviews about the next earthshaking development in the tablet sphere with Ari Zoldan, CEO of Quantum Networks. So if paper-thin tablets are out, what improvements can we expect? Toughness and water-resistance, perhaps? I think the next focus will be an ergonomic design focused on ruggedness," says Zoldan. "I think some people are paying a premium for tablets, only to be worried about tablets breaking and cracking. I just got back from Mobile World Congress, and the big focus there was water-resistance. Everybody had big tanks of water with their tablets submerged." So the hardware will get better, but Zoldan doesn’t think we’ll see any up-and coming-companies enter the hardware market in a major way. Instead, all the innovation will happen in the app development field. I think the big players already dominate the hardware side. But the [tablet] software industry is still at its genesis," says Zoldan. "The (tablet software) industry is wide open, and there’s going to be no stopping it. There will be opportunities for entrepreneurs to play in the software space." Zoldan says that software explosion will be boosted by the expansion of 4G networks and Near Field Communications (NFC) technology. In fact, Zoldan believes that NFC will allow tablets to "100% replace the wallet that you carry in your back pocket." You’ll be able to go to grocery stores and be able to pay with your tablet in totality," Zoldan explains. "Really, the concept of currency is going to change dramatically in the next 10 to 15 years, and it’s all because of the tablet." Finally, Zoldan says that some tablet innovation has to come from wireless companies and the federal government. He says they need to address the spectrum crunch by finding ways to open the spectrum, building more mobile infrastructure and expanding access for rural customers. He also believes that wireless companies will adopt a tablet business model similar to the one used for cellphones today, in which users are allowed a device upgrade every few years. I think they’ll give tablets away for free or subsidize them, similar to what happened in the cellphone industry. It may be based on a subscription-based model."